Like most innkeepers in smaller villages, she lives a peaceful existence without much happening, except the occasional customer every now and then. She offers her services every day, except when she's sleeping on the bedroll behind the counter between 2am and 6am. The exception to this schedule occurs when she, along with the other residents of the town, join in massed combat at the end of Mephala's quest. 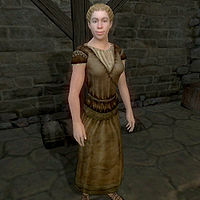 If she survives she will go back to the inn afterwards, but will no longer offer bartering services. This page was last modified on 8 July 2018, at 17:24.